Saltwater Fishing Orlando Florida comprises species like Redfish, Tarpon, Sea Trout and Snook. Anglers around the world plan vacations for Orlando fishing and targeting these awesome fish in the Mosquito Lagoon. The red drum (Sciaenops ocellatus), also known as channel bass, redfish, spottail bass, or simply red, is a game fish found in the Atlantic Ocean from Massachusetts to Florida and in the Gulf of Mexico from Florida to northern Mexico. It is the only species in the genus Sciaenops. The red drum is related to the black drum (Pogonias cromis), and the two species are often found in close proximity to each other; they can interbreed and form a robust hybrid, and younger fish are often indistinguishable in flavor. The common snook (Centropomus undecimalis) is a species of marine fish in the family Centropomidae of the order Perciformes. The common snook is also known as the sergeant fish or robalo. It was originally assigned to the sciaenid genus Sciaena; Sciaena undecimradiatus and Centropomus undecimradiatus are obsolete synonyms for the species. Not all serranids are called groupers; the family also includes the sea basses. The common name grouper is usually given to fish in one of two large genera: Epinephelus and Mycteroperca. In addition, the species classified in the small genera Anyperidon, Cromileptes, Dermatolepis, Gracila, Saloptia, and Triso are also called groupers. Fish in the genus Plectropomus are referred to as coralgroupers. These genera are all classified in the subfamily Epiphelinae. However, some of the hamlets (genus Alphestes), the hinds (genus Cephalopholis), the lyretails (genus Variola) and some other small genera (Gonioplectrus, Niphon, Paranthias) are also in this subfamily, and occasional species in other serranid genera have common names involving the word “grouper”. Nonetheless, the word “grouper” on its own is usually taken as meaning the subfamily Epinephelinae. 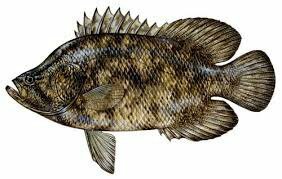 The mangrove snapper or gray snapper (Lutjanus griseus) is a species of snapper native to the western Atlantic Ocean from Massachusetts to Brazil, the Gulf of Mexico, and the Caribbean Sea. They can be found in a wide variety of habitats, including brackish and fresh waters. It is commercially important, as well as being sought as a game fish. It can also be found in the aquarium trade.